Fits Traxxas X-Maxx Motor 1717, 2028, 2217 56xx 58xx and more. 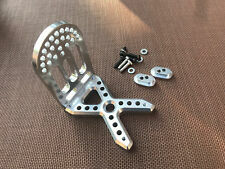 Traxxas X-Maxx 8s / 6s Ajustable Motor Mount 1/5 Brushless motor. This is a Super Tigre G71 RI engine. No muffler is included. I got this engine in a buyout. The engine turns over smoothly and has good compression. No reserve, no minimum. These are the Front Suspension Arm Guards for the Traxxas Stampede 4x4 VXL. Includes Two front suspension arm guards. Eight 3x16mm button head cap screws. We carry a full selection of beginner to advanced RC planes and RC helis. This is a K&B. 40 R/C engine with a K&B cast aluminum carburetor. I got this in a buyout. The engine turns over smoothly and has good compression. No reserve, no minimum. Reconditioned Zenoah G-38 Crankshaft that were checked out and or Realigned back to factory Spec's. Spider Stunt Drone. Condition is Used. Shipped with USPS Priority Mail. Great little drone, fun and entertaining, good starter drone for kids. Lightly used. What you see is what you get. Pm me for any more info. Thank you! Balanced wheels help improve performance, handling and tyre wear along with wear on bearings and suspension. Material:Aluminum alloy. 1/10th monster truck wheels. Do you love making fake fart noises to make others embarrassed?. The Le Tooter is a soft noisemaker that fits in the palm of your hand. Just squeeze it, and the air inside rushes out to create the most realistic fart sounds known to man! This is for a Lens Cover for your fatshark dominator v3s or HD3s goggles. perfect for when your storing your googles or out in the field. 1 x fatshark dominaotr v3/ HD3/ hdo lens protector (plenty of colors to choose from). This translates into a very smooth start up and acceleration. Motor Compatibility:Brushless sensored or sensorless. • ESC Overheat Protection: 85°C, 105°C, 125°C. ESC Overheat Protection:105°C. Lead Length:200mm. This engine includes the Cox barrel throttle assembly. I got this engine in a buyout. The engine turns over smoothly and has good compression. No reserve, no minimum. Tekin RS 1/10 brushless esc N, item is NEW, ONLY TESTED. BODY IS CLEAR. PEEL BACK BLUE LAYER ONCE PAINTED. 210mm wheel base. TBG DOES NOT CARRY INVENTORY! DECALS AND WINDOW MASKS ARE NOT INCLUDED but can be obtained from mci racing.